The world’s most comprehensive surplus asset management company, EquipNet, Inc. will be unveiling its revolutionary new sales channel, OWN IT NOW, to the public on January 17th 2017. The platform takes away the hassle of back and forth negotiations and allows prospective buyers to purchase items with the simple click of a button. The listings in the channel have starting prices and decreasing time intervals which are tied to price drops. As the clock ticks down, so does the price. The OWN IT NOW platform permits purchasers to view available listings and current prices. Each individual listing has a countdown that indicates when a price drop will occur and what the price will drop to. However, a user does not have to be actively watching the clock at all times to make a purchase, as EquipNet provides buyers with the option to set a proxy amount. By setting a proxy, the user is asking the system to automatically secure the item for them when the desired value has been reached. If the item is not purchased prior to the entered proxy amount, the user will be notified that their proxy has been accepted. EquipNet will then aggregate all purchases made across a single day, providing users with one invoice for all of their OWN IT NOW purchases made in that day. 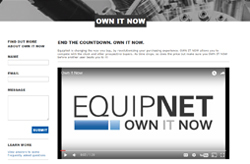 The OWN IT NOW sales channel differs in comparison to other EquipNet platforms such as SmartAuctions™, Live/Webcast auctions and MarketPlace™, as users will not be competing to outbid each other. Instead, they are competing against the clock and other prospective buyers. With OWN IT NOW, users can buy items at the current price or wait for the amount to drop at the risk of losing the item to a competitor. Massachusetts based EquipNet, Inc., has become the world’s largest surplus asset management company. The company offers a range of tools that allow companies to take control of their assets. For example, a proprietary software platform ARMS™ (Asset Redeployment Management System), can be installed across a client’s enterprise, allowing that company to identify, track, appraise, redeploy and sell their idle and surplus equipment. EquipNet also runs the largest online marketplace for pre-owned laboratory instrumentation, manufacturing equipment, and plant utilities. The company is also one of the largest industrial equipment auctioneers in the world. Their main markets are in the biopharma, chemical, consumer packaged goods, and semiconductor sectors, where their specialist knowledge of the markets is proven to deliver higher value than many of the ‘generalists’ in the market.